so proud we could pop | we got us a family here! 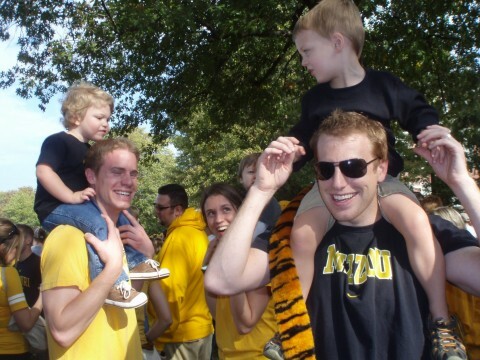 Homecoming at Mizzou has always been a big deal. We didn’t make it last year because a certain little gal had a bad run in with the swine flu. This year we were determined to make it happen. Everyone was healthy. The weather couldn’t have been more perfect (I mean really, upper 70’s and sun in late October?). And we had a free place to stay, thanks to Abbey. We enjoyed our favorite pizza ever, Shakespeares Pizza , with Travis’ aunt Georgann, uncle Keith & cousin Cori over at Cori’s apartment before heading out to see the House Decs on Friday night. I’ve explained this in year’s past, but the sororities and fraternities pair up to participate in many competitions during homecoming week, one being the competition for the best house decorations. This year’s theme was Board Games. We saw many great decorations and skits all themed around board games from our childhood. One of the perks of going to house decs with your kids is that you get to have prime seating. Every house has hay bales lined up for the kids to sit on. Here I am with Owen and Harrison watching the Monopoly skit. 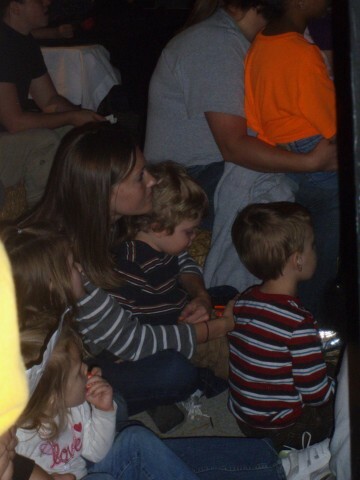 Owen and Harrison sat through each skit, taking it all in. Molly, on the other hand, really just wanted to run around. 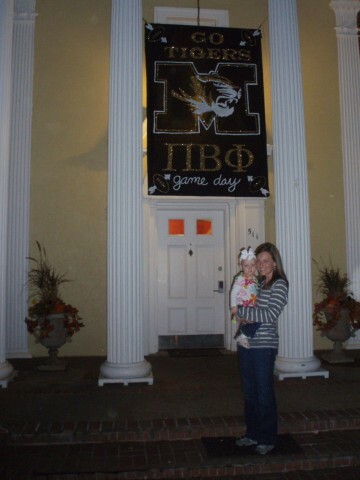 She really wasn’t into posing for a picture in front of my sorority’s house dec. Next year I need to remember to get less “us” in the picture and more of the actual house dec because they really are impressive. 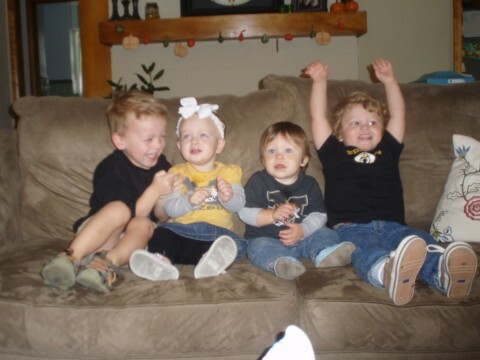 On Saturday we dressed the kids in their Mizzou best and lined them up for a picture. 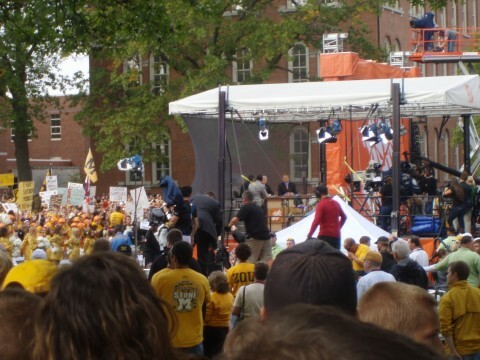 Then we headed out to see ESPN’s College Game Day on Mizzou’s campus. Travis watches College Game Day every single Saturday and has ever since I’ve known him. 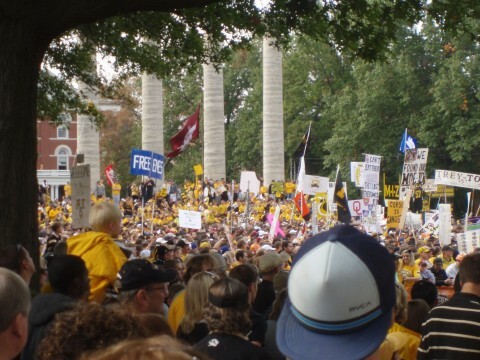 This was the first time Mizzou has ever had College Game Day on our campus, breaking the record by having over 18,000 people on the quad. It was CRAZY packed but very fun to be there. Here’s a shot of Kirk Herbstreit, Chris Fowler, Desmond Howard, and Lee Corso doing their thing. It really was so fun to be there. I think every single person I saw was wearing Mizzou apparel in one way or another. It was definitely a sea of black and gold. Directly following all the College Game Day festivities was the alumni pancake breakfast. 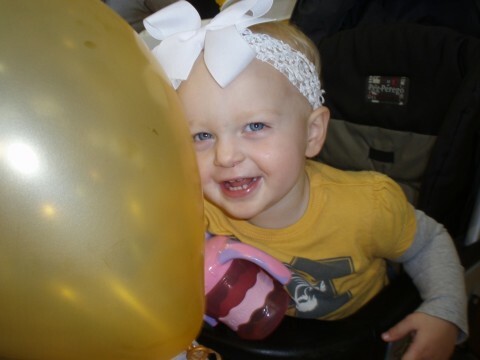 Owen couldn’t get enough of the pancakes, but Molly was more a fan of the balloons. Our final activity of the day was the Homecoming Parade. Owen and Molly were into it for about 2 minutes and then they preferred running around in the grass. We definitely spent more exploring the grassy areas outside the rec center than seeing the floats. Oh well. Another year. Here’s a shot of Owen and Travis while Owen was still enjoying watching everything pass by. During the parade we met up with Travis’s college friends, Jeff, Kevin, and Pat. 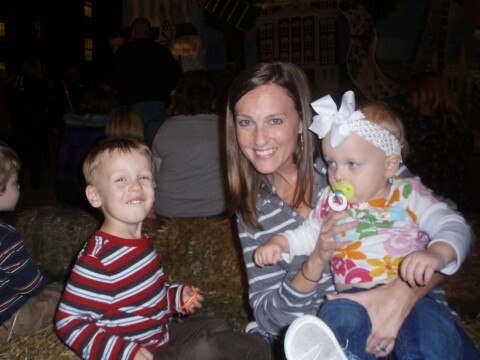 They had never met Molly before and she quickly gave them a glimpse of her friendly, happy personality. 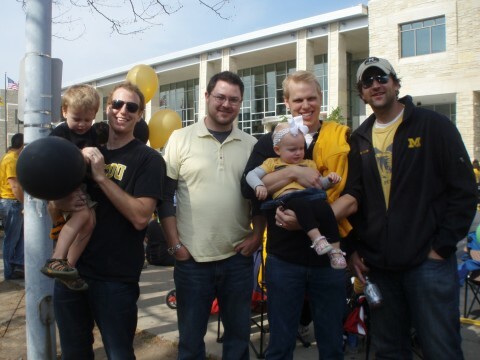 And one last shot of the guys and the kids before we parted ways. Great post! I almost felt like I was there! 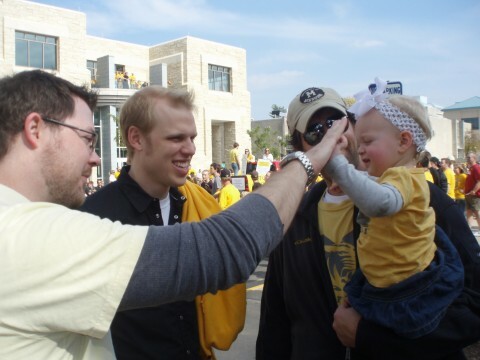 GO, MIZZOU! 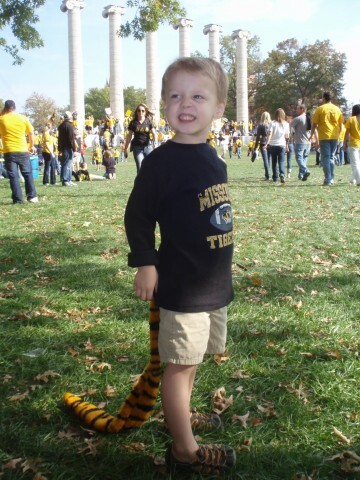 It’s so cool to think about the kids following the Mizzou tradition…..Tiger tails and all! 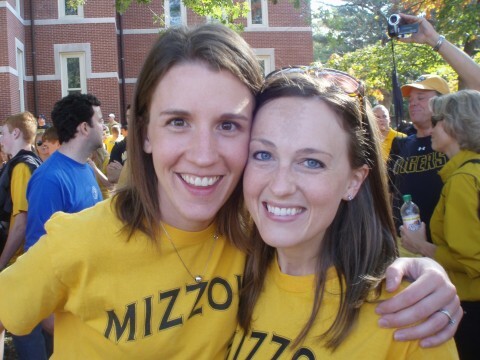 SO glad you had a beautiful weekend to enjoy being at Mizzou! Way to go, Tigers – now beat Nebraska!!!!! Loved reading this! 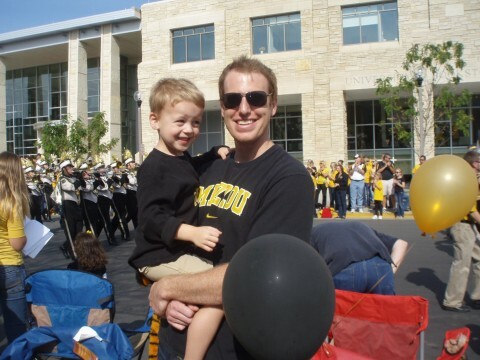 Neither John nor I went to Mizzou, but we have slowly been converted and have been watching games for awhile now (including this one) and have been saying for years that ONE of our kids will be forced to go there so we have an excuse to drive down for football. It will happen and posts like this help our case. Thank you and so happy you and the kids got to be part of something so awesome.